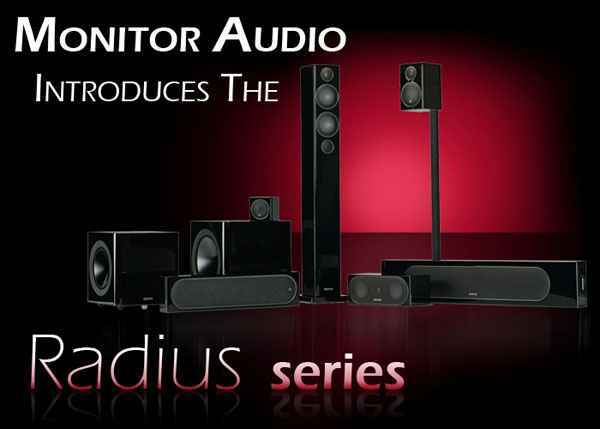 Earlier in August we told you about Monitor Audio updating its popular Radius range of speakers, and now North American distributor Kevro has announced complete details about the new series, along with pricing. In this new generation, the trademark Radius blend of great sound and a space-efficient design has been further refined to incorporate all metal alloy drivers and new models fashioned for the demands of today’s style-conscious audio fans. Alongside re-vamped Radius 45, 90 and 270 designs, the new eight-strong model line-up includes slimmed-down (to 2.56″ depth) versions of the 225 centre speaker and Radius One soundbar, together with a new Radius 200 centre-channel speaker and two enormously powerful yet super-compact active subwoofers: Radius 380 and 390. Key performance enhancements come from new all-metal driver configurations. For the first time in a Radius series, the new range utilizes C-CAM mid-bass drivers, featuring concave cone profiles introduced originally by the range-topping Platinum series and subsequently on Gold GX. The radically upgraded drivers benefit from the latest developments in cone geometry and drive mechanisms to extract optimum performance from Monitor Audio’s signature C-CAM material. Unlike conventional cones, which incorporate a centre aperture for the voice-coil, the new Radius bass cones take the form of a continuous rigid surface, coupled to a longer voice coil and larger motor by an innovative, more efficient drive assembly. Perfected by extensive FEA modeling, and supported by HiVe port reflex loading, the wholly revitalized Radius bass drivers offer greater drive force, longer excursions and lower distortion, producing cleaner, more extended and accurate bass definition. Complementing improved bass performance, a new 1″ C-CAM tweeter has been developed to deliver the widest, cleanest frequency range possible from the compact Radius cabinets. Applying refinements from Monitor Audio’s architectural speakers, the Radius tweeter vents internally through a specially designed housing and around the outside of the magnet system to a rear-loading chamber for much lower resonance and better damping. As a result lower frequencies at the crossover point with the bass driver are more accurately resolved, creating a smoother, more natural response from the system. New Radius model introductions include the Radius 200 centre-channel speaker, an alternative to the 225 and designed for specialized home theatre systems in which the centre speaker is mounted on a rack, cabinet or shelf. The entirely re-engineered Radius subwoofer cubes offer a dramatic leap in performance over their predecessors. Powered by generously up-rated amplifiers, they feature newly developed dual driver systems of side-firing active and passive ABR C-CAM drivers, colour-coded to match cabinet finish. Both ultracompact designs offer impact, music and movie EQ presets and a 12V trigger. The 380 has twin 8″ drivers powered by a 200W Class D amplifier – twice the power of the Radius 360 it replaces; the 390 uses twin 10″ drivers powered by a 220W Class D amp. Both amplifiers are DSP controlled and ABRs are tuned low to produce deep, taut, size-defying bass. The Radius series is available in Gloss Black, Gloss White and Walnut finishes. * Configuration and dimensions remain similar to its predecessor. * Single point ¼”x20TPI wall fixing. Use the optional Monitor Audio UWB or any standard wall bracket. * New 4″ C-CAM mid-bass driver. * New 1″ C-CAM gold dome tweeter. * Cabinet depth reduced to 2 1/2″ to allow for lower profile on-wall placement and more attractive appearance. Cabinet depth is 40% less than its predecessor. * Dual C-CAM mid-bass drivers with C-CAM tweeter in MTM style configuration. * Monitor Audio UWB included. * New ultra compact – dedicated centre speaker. * Smaller, compact size – cabinet depth reduced to only 2 1/2″ to allow for lower profile on-wall placement and more attractive appearance. Cabinet depth is 40% less than its predecessor. * Integrates three identical channels – 3 x C-CAM mid-bass drivers, 3 x C-CAM tweeters working in individual separate ported cabinets. * Change to single grille to further enhance the visual appearance and style. * Configuration remains similar to its predecessor. * New 4″ C-CAM mid-bass drivers. * New ultra- compact ‘cube’ shape high performance subwoofer. * Dual 8″ C-CAM drivers – long throw driven C-CAM bass driver and C-CAM ABR (Auxiliary Bass Radiator). * ABR is tuned low in frequency and designed to provide tight clean, but powerful bass. * Side-firing drivers with no grilles, colour coded to match the contrasting cabinet finishes (white has silver driver cones; black and dark wood finishes have black cones). * 200 watt class D amplifier with DSP – 100% increase in power over its predecessor. * Impact, Music and Movie Settings. * New compact ‘cube’ shape high performance subwoofer. * Dual 10″ C-CAM drivers – long throw driven C-CAM bass driver and C-CAM ABR (Auxiliary Bass Radiator). * 220 watt class D amplifier with DSP.